How is my Web site impacted by Facebook's replacement of the fan button with this "like" button? Should I add in a Facebook "like" button to all my pages? If so, how do I do that? Answer: Facebook business page owners noticed the change from "Become a Fan" to "Like" in early May shortly after Facebook announced the pending change on April 21st. In addition to the switch, Facebook also announced a number of other changes designed to spread their influence around the Internet. 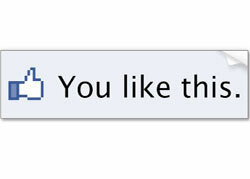 But as a Web site owner, your primary interest will be in the new "Like" button. Facebook "likes" have the potential of shifting how data is connected online. With this platform, users share sites with their friends whether they are on Facebook or not. Just a simple click of a button will connect their online identity with the page they are viewing. Clicking on the button will create a data record that can be accessed by advertisers and people in a user's social network. This is in stark contrast to the way sites are ranked now through search engines. For example, Google ranks sites based on several factors including their backlinks. Under the Facebook "likes" model, exploring the Web will be a much more personalized experience. There are two places that the "Like" button is now used: on Facebook business pages and as a stand-alone widget that can be placed on your Web site pages. When a Facebook user "likes" your business page or "likes" a page on your Web site, it isn't the same as liking a friend's post, a video or a link. By "liking" a page on Facebook or elsewhere on the World Wide Web, that Facebook user becomes connected to that page. Their profile update will show that they've liked that page, whether it's on Facebook or elsewhere.